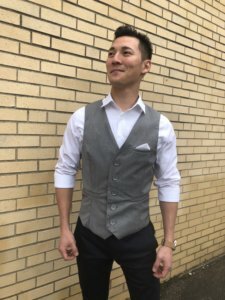 I was SO EXCITED to find the Toby K. Patterns Charleston Vest pattern. 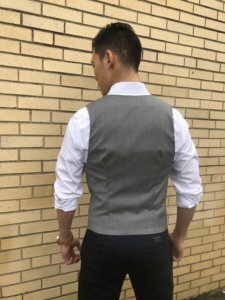 I had been looking for a fitted vest pattern for my husband for nearly a decade and boy, was it hard to find. 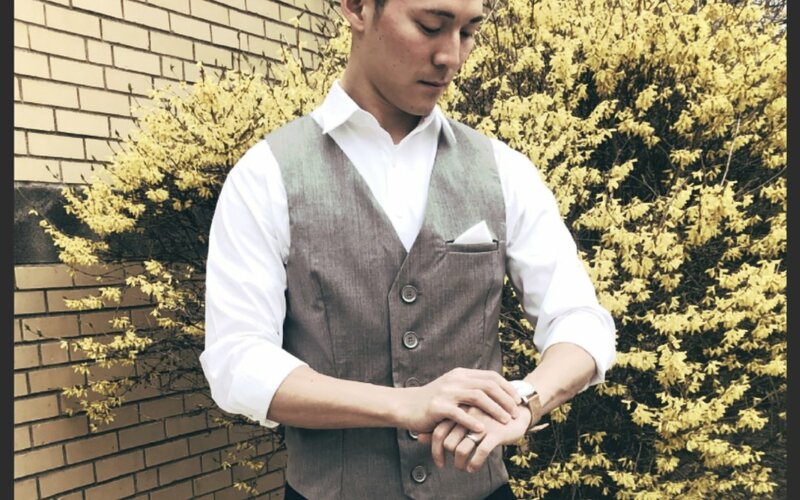 Most men’s vest patterns call for an adjustable back panel, but I wanted a more polished look that my husband could wear without a jacket and the Charleston vest fit the bill perfectly. I was lucky enough to find some fabulous wool and coordinating lining at my local fabric shop’s semi-annual warehouse sale and was able to purchase exactly what my husband was looking for at a steal of a deal. I love working with light weight wool blends because they are so easy to shape and manipulate, making it a great choice especially for the points on the front of the Charleston vest. I made a few modifications to this pattern, starting with removing the middle back seam by measuring out the seam allowance and placing the newly sized pattern on the fold when cutting out my pattern pieces. This modification worked well because the pattern piece called for a straight seam. I also needed to take each dart in twice the depth at the widest point in the middle, grading out to the original points at the top and bottom for the fitted look my husband was looking for. I started by fitting the paper pattern to him and although the paper wasn’t extremely malleable this was a great place to start with rough measurements which I was able to firm up later by fitting the fashion fabric to his body. The most difficult part of sewing the Charleston vest, for me, was sewing the welt pockets. This sewing project was only the second time I have done welt pockets and I had transferred the pattern markings from the pattern piece to the fashion fabric. I didn’t read the pattern instructions on placement because I had already transferred the pattern markings, but this was a big mistake. I didn’t have enough material to make traditional welt or double welt pockets along the waist and had to improvise by adding another layer of fashion fabric to create a faux welt pocket. This wasn’t ideal, but a workable solution since I had already cut and sewn around the welt pocket openings. Next time I make this pattern I will add a few inches on either long end of the welt pocket pieces and may even make the waist welt pocket openings a bit shorter. 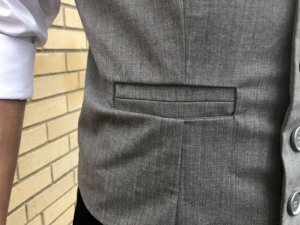 I was fortunate to be able to make a workable breast welt pocket. 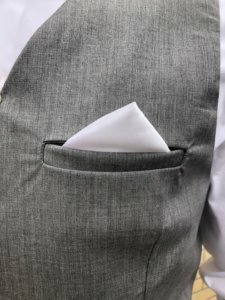 My husband loves to wear pocket squares, so I was thrilled to be able to make this a usable pocket. This pattern came together fairly quickly, with detailed and helpful instructions. All seams are concealed inside, creating a very professional looking finished product. 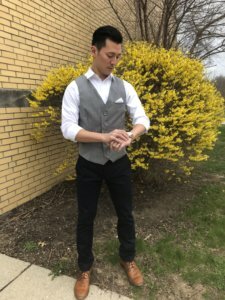 My husband really likes his version of the Charleston vest and is excited to wear it for Easter. Now to get to work on my dress! — Follow Marissa at sewhelpmebyMarissa.blogspot.com and on Instragram @Sew_Help_Me.